At the intersection of two streets in the heart of Chicago’s Ukrainian Village, an honorary street sign was unveiled and dedicated in 2012 with the words “Kyiv-Chicago Sister Cities” written on it. The symbolic importance of this sign is its ability to inscribe in the eyes and soul of every passerby that at the crossroads of two worlds, Ukraine and the United States, two cities have pledged their mutual kinship, support and cooperation with one another. Almost a half of a century has passed since the signing of the Kyiv-Chicago Sister Cities Agreement. During this time the city of Kyiv has endured the aftermath of the Chornobyl Nuclear catastrophe, economic growth and contraction, the revival of the National Kyiv-Mohyla University, the Orange Revolution of 2004 and the Revolution of Dignity in 2013-2014. Throughout this period, the dedicated and hardworking members of the Kyiv-Chicago Sister Cities Committee have advocated for transparency in government, economic reform, cultural exchange, medical training, investment and commerce. Under the leadership of Marta Farion and Vera Eliashevsky, countless programs were initiated including a fashion show hosted at the Chicago Cultural Center exhibiting designers from Kyiv and entitled “Because Life is Beautiful” (proceeds purchased a mammography machine), the commemoration of the 25th anniversary of the Chornobyl disaster, the visit of renowned jazz artists Orbert Davis and Lynne Jordan whose concert was attended by 500,000 participants in Kyiv, an exhibit of the works of seventy Ukrainian avant-garde artists, “Crossroads: Modernism in Ukraine, 1910-1930” also held at the Chicago Cultural Center, and the visit of Mayor Richard Daley and his late wife Maggie to Ukraine’s capital. Once again Kyiv and Chicago are at the crossroads, but this time it is overt Russian military aggression: the invasion and annexation of the Crimean peninsula, and the hybrid war raging in the Donbas region of Ukraine. There are an estimated 1 million internally displaced persons, widows and orphans, and over 5,000 deaths. 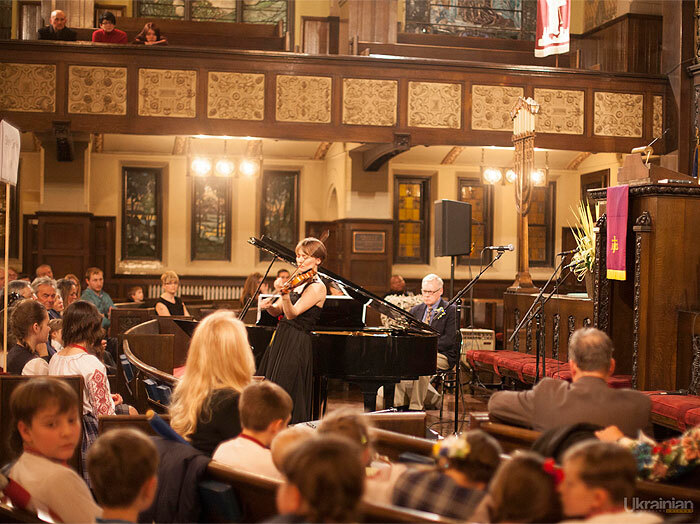 In response to this crisis Chicago resident Maria Storm, a concert violinist from Ukraine and 2nd place recipient of the Baltic Competition for Young Violinists, dedicated her efforts to organize a concert to raise humanitarian aid for those affected by the war. Her initial plans transformed into a collaborative effort with Vera Eliashevsky and Lev Holubec of Kyiv-Chicago Sister Cities, Howard Tiffen and Pastor David Neff of the historic landmark 2nd Presbyterian Church in Chicago’s South Loop, and Lada Pastushak of the US-Ukraine Business Council. Under the watchful gaze of 175 sculpted angels in the sanctuary of the 2nd Presbyterian Church, Maria Storm’s vision came to fruition on March 28, 2015. 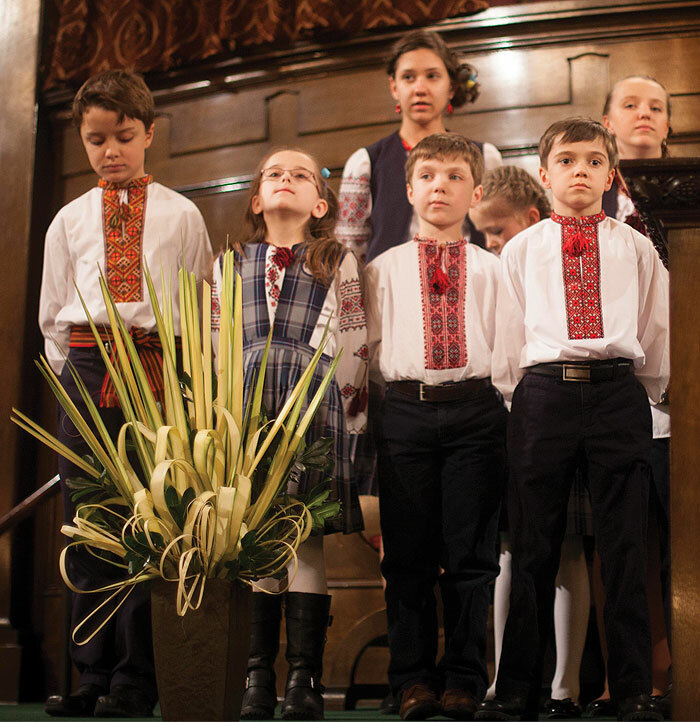 Human angels, the children’s choir of St. Nicholas Ukrainian Catholic Cathedral School, under the conductorship of Iryna Dychiy, opened the concert by singing the national anthems of the United States of America and Ukraine. In her opening remarks the Chair of the Kyiv-Chicago Sister Cities Committee, Vera Eliashevsky, cited a recent United Nations report that over 5 million people are in urgent need of humanitarian aid in Ukraine as a result of Putin’s hybrid war. Monies raised will be dispersed through the Ukrainian Federation of America. Lev Holubec, Kyiv-Chicago’s business subcommittee Chair, served as emcee for the program and shared the concern of concert participants that in truth Russia has invaded Ukraine and breached international law. We need to tell the world that this is not an internal crisis, but an actual invasion and threat to Ukraine’s sovereignty and the stability of Europe itself. The Consul General of Lithuania, Marijus Gudynas, was present at the concert; a powerful reminder of Lithuania’s steadfast support of Ukraine. Maria Storm shared her story of sleepless nights and anxiety-driven days as she attempts to find ways to help family and friends affected by the war. Having recently returned from a visit to Kyiv she stated: “I need to do something.” She picked up a violin and played, organized this concert, and invited a stellar cast of fellow musical artists to participate. It was fitting that she performed Bach’s solo violin excerpt of the Chaconne as her opening piece. Bach aficionados resonant with the performative power of this piece: challenges are transformed into grace and beauty. A concert pianist from New York, Emiko Sato, accompanied Maria Storm as she performed Schumann’s First Movement of the A Minor Sonata, opus 105 and Bartok’s “Romanian Folk Dancers.” One of the highlights of Maria Storm’s performance was Bloch’s “Nigun” for violin and piano. 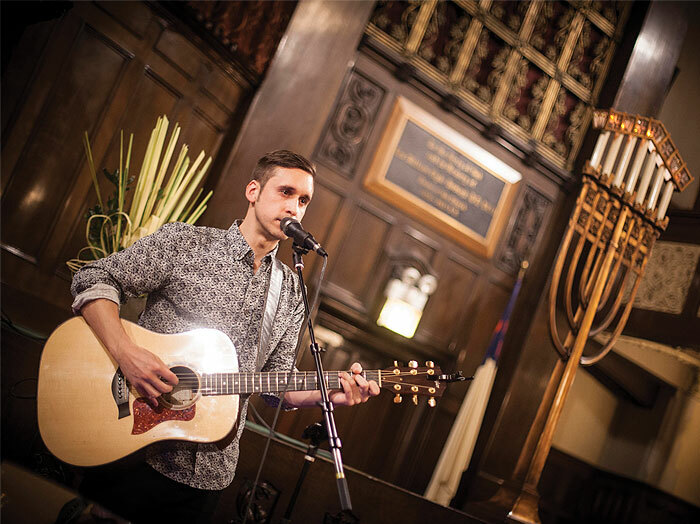 Dedicated to the active participation of Ukraine’s vibrant Jewish community on the Maidan and in the struggle with Putin’s totalitarianism, the intention for playing the “Nigun” was to transport both the listener and the performer into the transcendental realms of spirituality. Although Bloch may not have referenced Jewish sources directly, the opening violin motif is identical to a phrase from Ashkenazi biblical chant. Maria Storm’s performance, grace and professionalism are no doubt the reason why the Chicago Tribune’s classical music critic John von Rhein included the “Concert for Ukraine” in his list of classical music recommendations for the weekend. Constance Volk, a recipient of the Ella Fitzgerald Award for Outstanding Voice, hypnotized the audience when she performed Led Zeppelin, Chris Cornell’s “Seasons,” and Maria McKee’s “If Love is a Red Dress (then hang me in rags).” Constance’s passion for song was evident in her uniquely velvety and smoky voice. 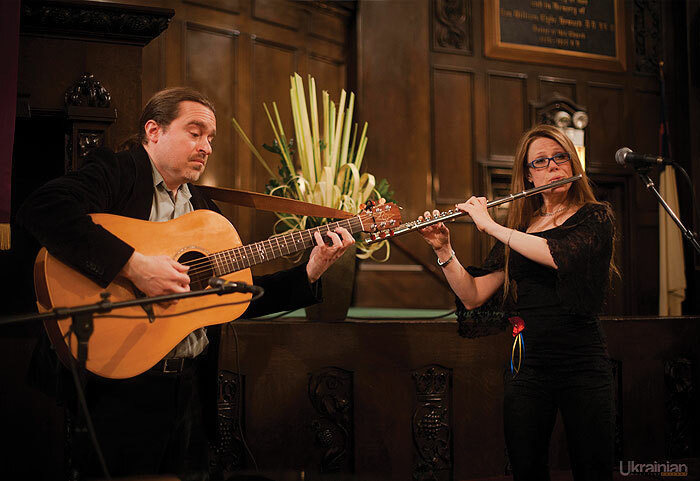 A regular performer at venues such as “The Green Mill” and the “Hideout,” she is also principal flutists of the “New Millennium Orchestra” and a founding member of the artists collective Catalyst Chicago. 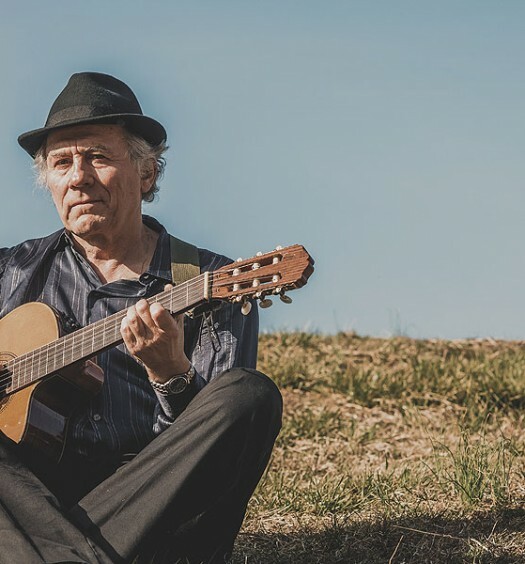 Grammy nominated Matthew Santos is a painter, American rock and folk musician and song writer. He opened his performance with a deeply soulful rendition of “The House of the Rising Sun,” and continued with original works form his album “Under the Microscope.” Santos toured with Lupe Fiasco in 2008 and has appeared on Jimmy Kimmel Live, and on the programs of Ellen de Generes, Craig Ferguson, and David Letterman. 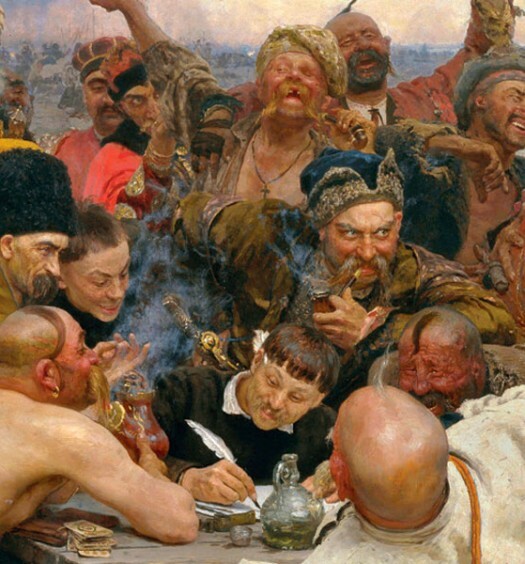 Sergiy Fomenko recently presented an art exhibit entitled: “Maidan. Ukraine. Road to Freedom” to members of the U.S. Congress. 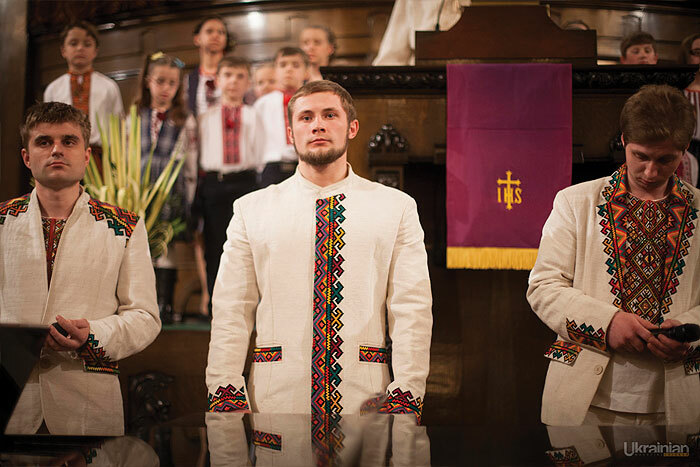 This granted Foma the opportunity to perform in Chicago and to sing his amazing rock interpretations of Taras Shevchenko’s “Reve ta stohne,” and “Dymu Moyi.” Participants clapped their hands and stomped their feet as they listened to verses of Ukraine’s great bard which they learned as children. One of the students of the St. Nicholas Ukrainian Catholic Cathedral School, Olesh Tymouch, read a poem he wrote and dedicated to his friends in Ukraine whom he left behind and hopes to meet again at a time when peace reigns once again in Ukraine. The concert ended with “Plyve Kacha,” sung by the Trioda male ensemble from Ternopil and the Ukrainian national anthem led by Sergiy Fomenko. The “Concert for Ukraine” was truly a unique event inspired by Maria Storm and organized by many volunteers and supporters of the Kyiv-Chicago Sister Cities Committee.